72001 B-24 Liberator: Resin nose & main wheels. Crisp faultless casting with tiny injection stubs that just snap off. 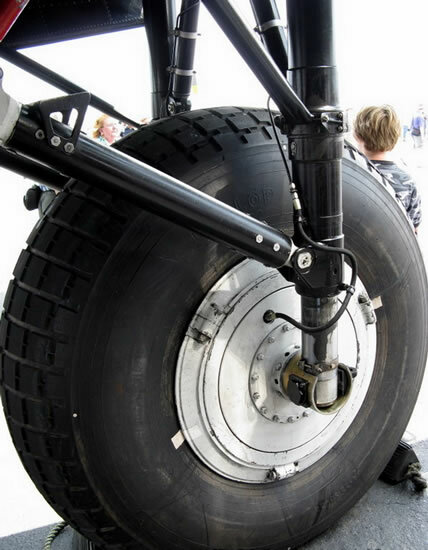 Tyre weighting is moderate reflecting an unladen condition applicable to most parked aircraft situations. Circumferential ribbing and “Dunlop” branding on Lancaster sidewalls will I think need to be sanded off for accuracy in most cases. Superbly cast and well packaged, the moderate weighting is a nice touch. 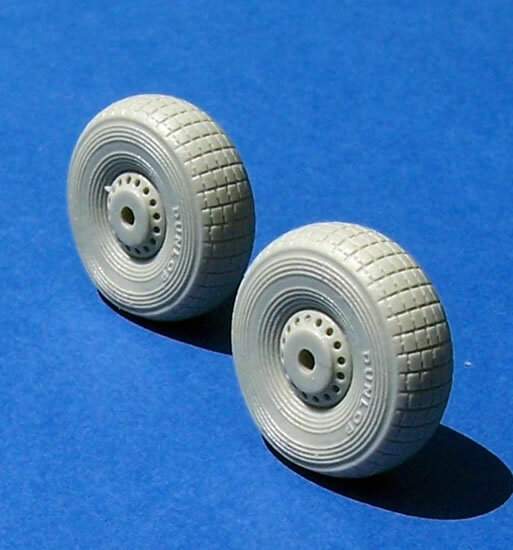 The Lancaster tyres have sidewall detail that is I believe inapplicable to most in-service Lancasters, and will need to be removed for accuracy. The B-24 Wheels are unconditionally recommended, but buy Lancaster wheels only if you don’t mind doing some sanding. Hussar Productions is probably best known for their range of military vehicle wheels and accessories. They have also produced some aircraft decals, but I think that the wheels reviewed here are their first foray into aircraft accessories. 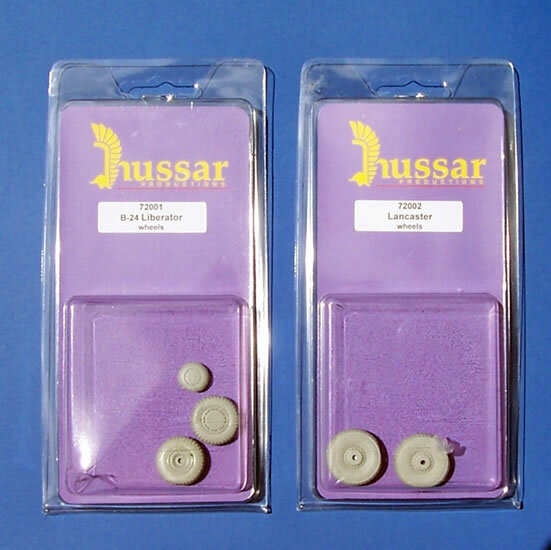 Searching the web soon reveals quite a bit of discussion and listings of Hussar Productions’ range, but stockists, especially of the aircraft wheels reviewed here, were very hard to find. They are, however, available from AirConnection's online store. The items come in quite large clear acetate bubble packs with card header. The wheels are superbly cast and appear faultless. They come with commendably fine injection stubs that I was able to snap off cleanly using my fingers. The tyres are nicely weighted to reflect an unladen aircraft. I prefer this to very heavily weighted tyres, suitable only for a fully bomb and fuel laden aircraft, because in reality aircraft only spent a limited part of their time on the ground fully loaded. The block tread on both sets of tyres is very pronounced, and reflects what I think would be a brand new tyre. Some may wish to sand the tread down a bit for a more worn look. I was immediately struck but the sidewall detail on the Lancaster tyres, consisting of circumferential rings and “Dunlop” branding, as it was unlike any Lancaster tyres I could recall seeing. I flicked through no less 18 Lancaster books and numerous images on my hard-drive, studying those where the main-wheel sidewalls were clearly visible. In all cases the sidewalls were smooth. It was only in a walk-around of the restored Canadian Lancaster C-GVRA that I could find a tyre resembling the ones produced by Hussar Productions (please see accompanying image). This will obviously be a modern tyre, and so may differ in detail to wartime tyres. 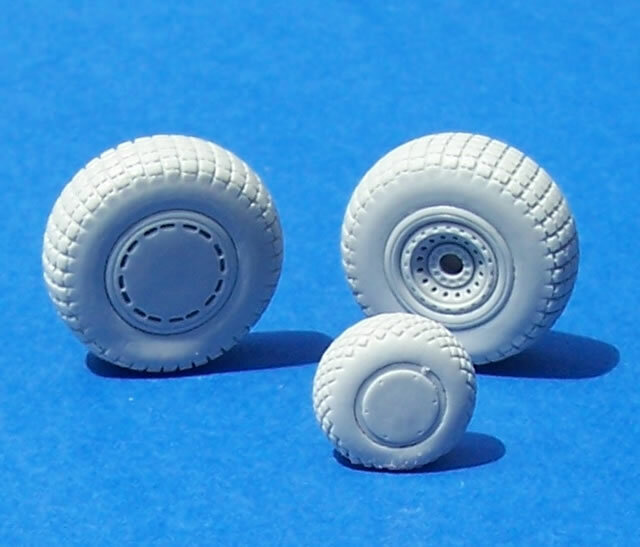 The sidewall detail is not a major problem if my view that most Lancasters had smooth tyre sidewalls is correct; it just means that the sidewall detail will need to be sanded off for an authentic model in most instances, so check your references. These are good quality replacement wheels. The Lancaster sidewall detail is a relatively minor issue as it should sand off easily and quickly. So the B-24 wheels are unconditionally recommended, but buy the Lancaster wheels only if you don’t mind putting in a few minutes of extra elbow-grease.